MultiEngine plus MultiTools. The all-purpose MultiSystem from STIHL soon has your garden shipshape again. 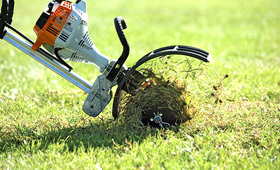 Whether for tending the lawn, cultivating the soil or clearing large areas - with the STIHL MultiSystem, only one machine is needed for all the various jobs. You alone decide what you want and need. The STIHL MultiEngine at the heart of the system can be combined with all the tailor-made STIHL MultiTools - quickly and easily so that you are always ideally prepared for the job in hand. Please be aware that the STIHL MultiEngine is no longer available. MultiTools are only included for current MultiSystem owners.